And here’s a post to help you kill some time before the end of the day! : ) Nah you don’t have to thank ME – thank this gorgeous bride and groom! Nicole and Ronnie were married at St Francis of Assisi and then we headed to some farm land for formals and then to the always beautiful Bittersweet Farm in Westport for the reception! I don’t know if you remember, but Ronnie and Nicole had some super fun ideas for their engagement shoot so there was NO WAY their wedding would go without their creative touch! There were so many fun details that these two crazy cats put their heart into… and it shows! The guys were a lot of fun and showed their support whole heartily through their celebrating and the ladies looked gorgeous with hair and make done by the amazing ladies at Glitz and Glam Bridal Designs! That with DJ services provided by Chris and Jeff at Studio 76 and flower by Pomfret‘s… it was quite the local affair! Overall it was one of my favorite weddings and I wish nothing but the best for these two love birds! First off… some fun getting ready shots (literally)! Here are some of those fabulous details! Ronnie thought he was quite the comedian during the cake cutting! And then the REAL party began! 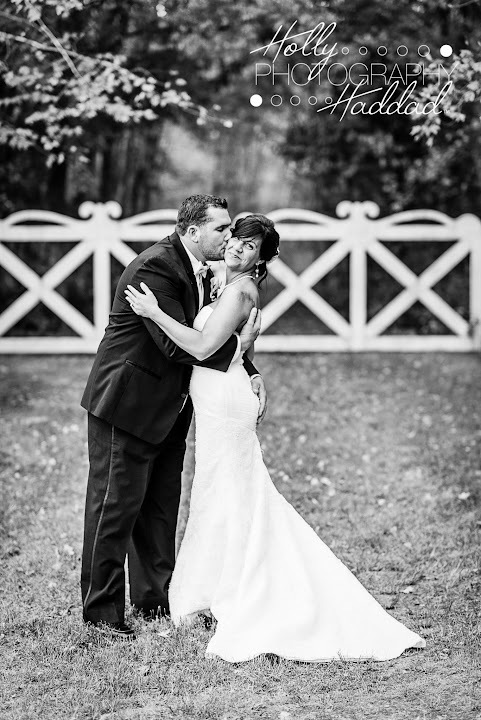 Congrats to you two…beautiful, funfilled wedding photos. Holly did an amazing job capturing your day. Nicole you looked just beautiful! !